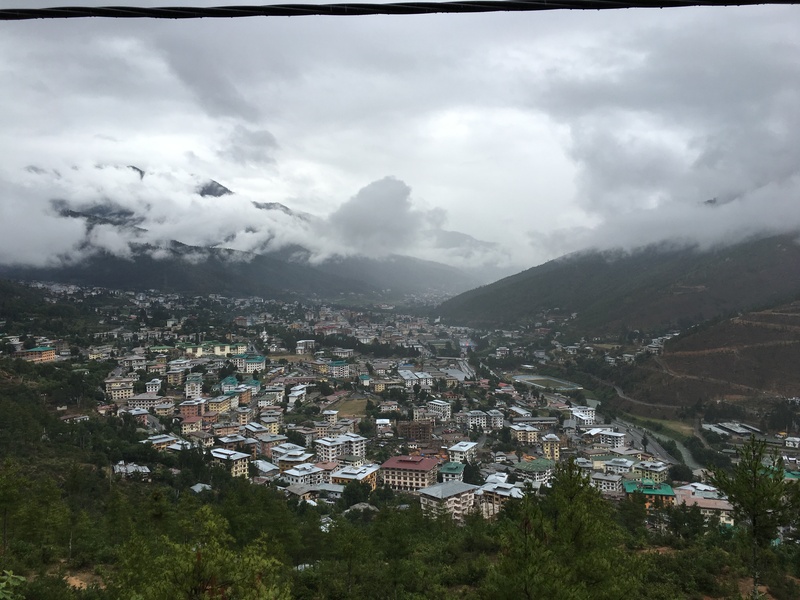 In and around Thimphu, we spend our first full day in the country visiting the National Zoo, the craft and farmer’s markets, and walks through town to see the National Library and an Art School. On the way to the National Zoo to see the Takin, we stop along the way to see the mountainside carving and painting of Padmasambhava. Literally everywhere in the country, travelers find the signs of Vajrayana Buddhism. If you look closely enough on roadsides throughout the country, you’ll find evidence of Buddhism. It is, literally, everywhere. One is immersed in the heart of Vajrayana. Around Thimphu, a visitor quickly discovers that the city, a bustling hub of human interaction and business, is small, confined to a valley quickly filling with apartments and businesses. A glance at Kuensel, one of the Bhutanese newspapers, reveals that people are moving to the city in droves. The air of hustle and bustle is clear to anyone who travels to this distant capital city. The population of Bhutan, around 800, 000 folks, work in primarily agricultural settings and the pull to leave the land and move to the city is strong. As a money economy spreads across the country and into remote agricultural areas in the country, the push to make money, to have cash in hand, is a strong incentive for a move into cities. While I am not a statistician and have not measured the change in numbers, the efforts to build more housing in Thimphu and the rise in population is obvious to any observer of Bhutan who has visited the country a few times. Thimphu hums with activity and is driving internal immigration. The impact will be, I imagine, profound on the country as the years progress. In fact, in the evenings, walking around Thimphu you will find the whole town out and about. The streets are filled with people. Impromptu veggies stands pop up, stores are open and people are gathered in the street talking, laughing, going somewhere. I talked to a group of what looked like high school young men walking with a soccer ball in hand, asking them about their night time activities. They were all headed to a friends house to watch a match on TV (this friend had satellite TV and they didn’t). Then they wanted to know who my favorite Premier League team was and I asked, in a joking way, if there were ANY good teams in the league. They all looked shocked at my question! Then I said that it didn’t matter anyway because Germany was going to beat everyone anyway. They laughed out loud at this assertion and, as a group, walked away, arguing about the Premier League teams. I stopped to talk to a woman selling what looked like turnips (or radishes) and asked about her produce. She told me she was worried that I might draw too much attention to her as the sale of vegetables at night was not allowed. I did not pry and asked about her crops…she grew them in her back yard and tried to make a little extra money. I asked about price and she said she sold the plants for 1 ngultrum each…that’s 1/65 of a dollar. (about 2 cents or so). Finally, a few students and I were looking for live music, to hear music in Bhutan. We wandered in and out of a few clubs and asked folks about music. They directed us to a very small room in the basement of a building. With no markings on the door, we opened it only to find a group of guys sitting around a small table eating bowls of food. I asked, “Are you playing music in here?” They all laughed loudly. I laughed and they laughed at my laugh. I closed the door and moved on, chuckling along the way. The road out of Thimphu winds slowly up to Dochu-la Pass at 3,100 m. The climb takes you through a heavily forested landscape with an occasional hillside cleared with houses dotting the landscape and farmers plying their craft in fields just below their houses. Some of these villages are perched precariously on these mountains and hills as the terraced fields surround the house. Seen from a distance, these communities appear idyllic as white-painted walls offer a striking view. The reality is much more challenging for many families as folks try to make ends meet growing Bhutanese red rice, millet, and other grains. Many of these communities thrive on the crops they harvest, selling their wares in markets that pop up on roadsides and in villages. Bhutan travel is a trek along this single main road that crosses the country from west to east. The black asphalt road contours around the mountainsides of the country, goes up and over a series of passes (like Dochu-la Pass) of over 3000 meters and into valleys scattered across the country. Along the roadway are a wide variety of flora and fauna that includes everything from rhododendron forests to alpine heights stretching into the distance. Houses dot the landscape along this road, as you can see, and folks are seen walking along the road for almost its entire length. One of the jokes in Bhutan is that only one stretch of road is straight, a one mile or so piece of road in Bumthang. Once at the top off Dochu-la Pass, a small temple, Druk Wangyel Lhakhang, and visitor center is situated along the road. In the very center of the road on the top of the pass are a collection of 108 chortens in honor of Bhutanese soldiers killed in a battle against insurgents along the southern Bhutanese border with Assam. The stop at the top of the pass is a welcome rest from the winding roads just below and to come. Looking down from the temple on the pass; notice the road is divided around the Chortens. On our stop, we pause for tea in the small Druk Wangyel cafe. We sit at tables outside as the clouds swirl around us. A kind of fog engulfs the pass and we are surrounded by these tiny droplets of water. The long ride down the from the pass winds around the the mountain sides toward Punakha, Lobesa, and the Puna Tsang Chu river that flows through both Punakha and the Wangdue Phodrang districts in this part of Bhutan. As the bus descends into the valley, temperatures rise and the valley floor, is much drier than the virtual rainforest of the slopes of the mountains above it. Rice fields abound and these fields, irrigated by the various river systems in the area, yield bright green crops of Bhutanese red rice. Looking Across the Valley toward the Temple of the Divine Madman covered in clouds. Once on the valley floor, we make our way to Punakha Dzong, one of the most remarkable places in the country. This former fortress protected Bhutan from raiding armies from Tibet. The walls of the Dzong rise high above the valley floor as the Mo Chu and Po Chu rivers merge just at the base of the structure. Punakha Dzong above the Mo Chu river. Our day of driving and site seeing is coming to an end and we make our way back to Lobesa and the Lobesa Hotel. We rest, relax, and share stories around the table of our adventures over plates of red rice and veggies. A Meal at the Lobesa Hotel. 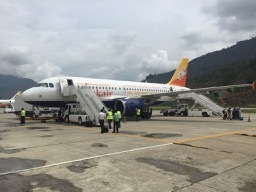 plane, I took my first tentative steps onto the tarmac in Paro, Bhutan in June 2015. The air was moist as a recent rain storm had blanketed the town and glimmers of light pierced the clouds above dancing along the hills and trees behind the airport buildings. Once on the ground, I walked directly into the waiting area, prepared to show my visitor’s visa and passport. The open hallway is decorated in vivid colors and images of past and present monarchs of Bhutan hang above the entryway. The open area funnels people toward the wooden desks where officials are waiting to scan documents and check visas. The immediate feeling is one of quiet and kind efficiency. Smiles are abundant, and the feeling I got was one of an easy going, professional attitude from the staff. Bags come quickly and the final customs check is made as an additional security scan is necessary to enter the country. As I walk out of the building, I am met by Namgay, our guide from Illuminating Tours. His friendly hello and welcoming attitude is noted by all of the group I am with. Instantly we feel relaxed after two days of travel from the U.S. to this country in Asia. Gathering our things, Namgay and our driver Suba load the bags into the vehicle, a small bus with comfortable seats for about twenty folks. We are ten travelers on this trip and have room to spread out. We begin our experience in Bhutan driving out of the airport and then around the grounds and into Paro town. Our goal, tonight, is Thimphu, the capital city. We head out onto a dirt roadway and then onto a divided highway with passing lanes on some parts of the road. We travel through a canyon as mountains on both sides of the road rise up to frame the walls of the drive. The hills are touched with mostly pine trees. The area is dry, very much like the place we are from, New Mexico. The hills around us, in fact, look almost exactly like our home. Maybe that is why we are all at ease with this trip, one that we have experienced in some way back home. The road is crowded with vehicles on this morning and with wind our way through the hills and along a river toward the capital. After about an hour, buildings rise up along the roadside and the going gets slower as we make our way into the city. On one side of the road a new car dealership, bright and modern, sits next to a building constructed with bamboo scaffolding. As the road gets narrower in the town, the area bustles with folks walking along the side of the road. Most folks, in traditional dress, line the streets as we make our way into the interior of the city. Signs of construction are everywhere and those of us who have visited before notice the dramatic changes to the city. Apartment buildings, stop fronts, all kinds of structures rise on the hills in the town. As we wind our way in to the city proper, we pass the one traffic stop, a police officer directing cars along the roadway, dogs laying in the street, the hurried-slow pace of this hub in Bhutan. We wind our way back and forth along the streets and finally head up a hill toward the giant Buddha being built above the city. 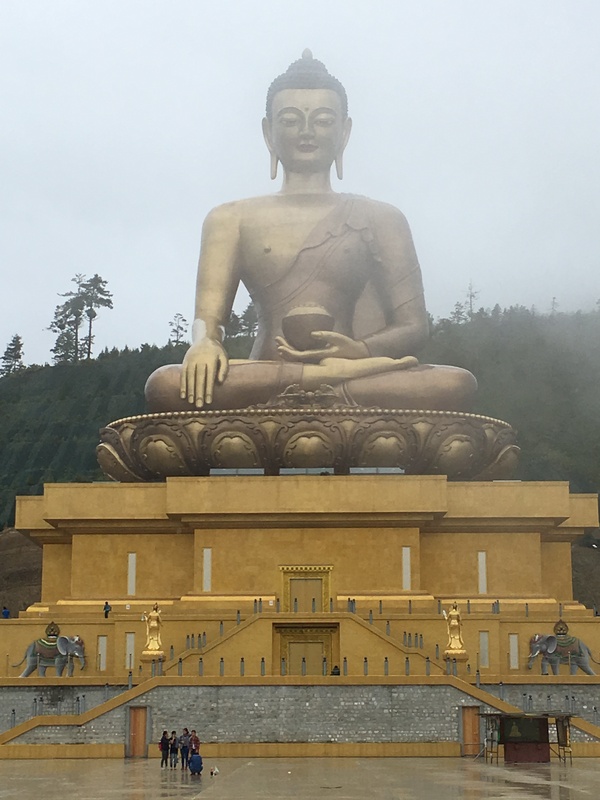 As we make our way up, up, up to the structure, the clouds cover the sky and a grey pall rests over the Buddha. Wisps of fog dance around his head, standing about 50 to 75 feet above us. The gold of the statue shines with the glint of water even in the grey of the cloud cover. Looking out across the Thimphu valley, the din of construction is distant, and the city looks and sounds much more peaceful than it is. The platform we are standing on is being tiled….a huge undertaking. We walk from end to end and count hundreds of steps. The platform will eventually serve as a ceremonial area with hundreds gathered for religious ceremonies. Our group takes numerous pictures and we marvel at the architectural achievement of this place. The Buddha, serene, sits behind us as we take pictures of the group. One member, Layla, leaps in the sky as happiness grabs her. We all laugh at the spectacle and realize, maybe for the first time, that we are really and truly in a place that is unique, special and wonderful. Someone wonders out loud what other wonders the remaining day and the following ones will bring. As the year changed to 2018, the trip to Japan and Bhutan comes into focus. The start of the flight search begins in earnest. Daily updates come across my laptop from a few websites: Kayak, Vayama, Cheap-O-Air, and Justfly. You can find a wide variety of web apps and tools to track down the cheapest flights; in fact, that’s not the challenge of traveling to Asia. The challenge is finding the right combination of flights on the best airlines. Out of LAX, China Eastern has a very low price for flights to Asia. The problem is that the airline has pretty awful ratings out in the internet land. On the website Skytraxx, many negative reviews of the airline abound. I’ve been hesitant to take the cheapest path to Asia considering the timing involved in travel across the globe! One missed or delayed flight can completely transform a trip the point that the huge chunks of travel have to be changed. For this summer’s trip, I’ve nailed down a few pieces which include a trip to Hiroshima and Miyajima via bullet train and ferry. The visit to Hiroshima should be on everyone’s list of places to see. A visit to this city offers understanding of the destruction that came with the atomic bomb and the suffering of the individuals who faced that trauma. This awareness is an important part of understanding world history and the significance of the bomb in defining U.S. and Japanese policy. For our Thailand piece of travel, we will be leaving the city via the Don Mueang International Airport. We will stay across the street from the airport and fly direct to Osaka, Kansai Airport. The nice part of flying into Osaka is that we can take a very short train ride into Kyoto (just 45 minutes) as opposed to the 3.5 hour train ride from Tokyo. I’ve been to both Narita and Kansai, and prefer Kansai as a way to reach the southern part of Japan quickly. Finally, in terms of Bhutan, our plans are coming together. If things work in our favor, we will travel to Mongar and Lhuntse in the far eastern part of Bhutan. 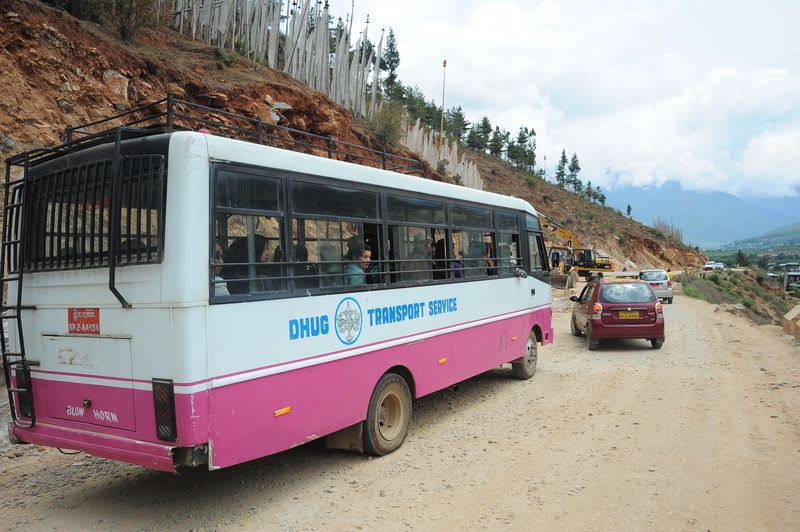 That trip will depend on road conditions, road construction, and time….going anywhere in the country takes time on the road…winding around the mountainside, to villages and communities far from the cities of Paro and Thimphu. The drive and the distance IS worth it as we experience the country in a way few folks have the chance to see. If you are on the trip and reading this blog, it’s time to get things organized; passports, vaccinations, etc. Things move quickly this Spring and before you know it, we will be flying across the globe! Hiking in the Haa Valley with Cows.